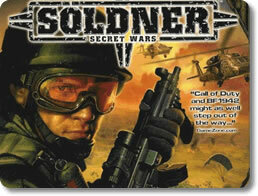 Soldner: Secret Wars Game - Download and Play Free Version! War has changed. It’s no longer fought openly between opposing nations and ideologies; it’s now fought in secret by specially-trained mercenaries called “soldners.” As a new recruit, do you think you have what it takes to succeed? Choose your side and test your mettle in Soldner: Secret Wars! 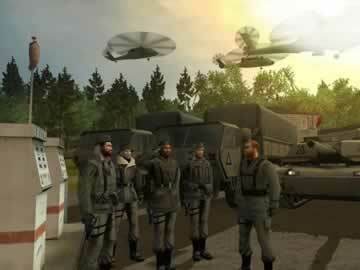 Victory will not come easy for you and your team in Soldner: Secret Wars. You’re going to need a lot of firepower, armaments, creativity and a willingness to fight dirty. Includes over 50 weapons. Use a myriad of pistol side arms, assault rifles, sniper rifles, grenades, missile launchers and more! Collect money for both yourself and your group and use it to purchase better equipment and vehicles. Features fully destructible environments! Level the opposition’s buildings to ensure they have no place to hide. Mobility is an important component to battle. Fortunately, Soldner: Secret Wars doesn’t stint in this area; it gives you everything you need to wage war from the land, sea and air! Drive a variety of land vehicles, including jeeps, hummers and APCs. Use them to cover ground quickly, transport troops, provide more firepower, and more! Take control of 15 tanks and crush the opposition under your mighty treads. Pilot over a dozen helicopters, including the Mi-24 Hind and Apache Longbow. Break the sound barrier with nearly 20 jets, from the A-10 Thunderbolt to the Harrier. Shooting other players can be all well and good, but no virtual war is complete without some set goals to accomplish. Soldner: Secret Wars includes seven different types of matches to keep your occupation forces occupied. Capture the Flag: Infiltrate your enemy’s base and steal their flag before they get yours. Capture the Vehicle: Get inside the marked vehicle and see if you can get it back home in one piece. Conquest: Battle for control of an empty base. Super Conquest: Battle for supremacy over a string of bases. Deathmatch: Test your shooting skills against another player. Team Deathmatch: Make sure that your team is the last one standing when the smoke clears. 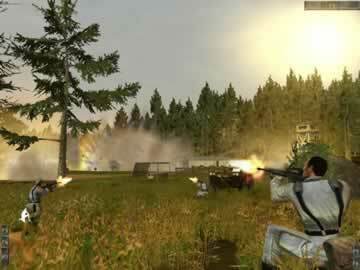 Frontline: Wage all-out war against the enemy army! Soldner: Secret Wars offers a lot that you won’t find in many modern multiplayer shooters: flexibility. With hundreds of weapons, dozens of vehicles, and maps that are absolutely sprawling, there’s no wrong way to make it as a career “soldner.” Want to be infantry? It can be done. Want to do reconnaissance? It’s a valid strategy. Want to transport troops and supplies? Go for it! Best of all, Soldner is completely free! Every shooter enthusiast needs to check it out; it’s a battle that can’t be lost!